IRP visited the site of the 2008 Sichuan Earthquake to study the current recovery status and conduct a field survey about the role of the local community in the recovery process over the last 2 years. 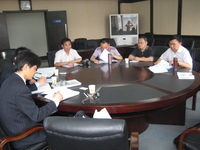 After meeting with reprsentaives of the Civil Affairs Department of Sichuan Provincial Government to learn the government policies on recovery and reconstruction including the Twinning Assistance Program, the research team composed of IRP staff members accompanied by the provincial government officials visited Penghua village located in Mianzhu City. This visit aimed examine the current situation as well as explore the role of local industries, especially wall painting and silk embroidery in the post disaster livelihood recovery process. The team also visited the "Mianzhu Wall Painting Training Center" which was constructed under the Jiangsu Twinning Assistance Program. The team interviewed the village head of Penghua Village, and some local residents regarding the current situation of earthquake recovery. Then, the research team visited other severely affected areas including Beichuan region, which is home to the ethnic Qiang people. The team interviewed several residents in Jina village where the stone houses are constructed according to the ethnic Qiang traditional style, and also interviewed residents in Shiyi Village located in a high mountainous area where people are engaged in ethnic tourism business especially after the earthquake. Based on the findings from this field survey and interviews, IRP is now compiling a report titled "International Comparison of Community Governance" which will be of great use for government policy makers engaging in post disaster recovery across countries.